This article is long, so I’ll spare you a lengthy intro. Here’s everything you should need to know in order to dominate your Week 13 DFS tournaments and cash games. Following Kareem Hunt’s release, Spencer Ware (DK: RB31, FD: RB37) becomes a near must-play on all sites. Ware is one of just three active running backs on the roster, and the other two (Damien Williams, Darrel Williams) have combined for only six touches this year (compared to Ware’s 36). Throughout his career, Andy Reid has typically employed his lead running back as a bell cow, and, for fantasy, has found a great deal of success in doing so. Even if Reid opts to use Ware in more of a committee, he should still be a lock for 10-15 carries and a handful of targets. On the league’s most efficient offense, that would still make him one of the top values of the slate. Danny Amendola is doubtful and DeVante Parker (DK: WR58, FD: WR38) is questionable for Sunday’s game against the Bills. The only other active Miami wide receivers to record a catch this year are Kenny Stills (DK: WR58, FD: WR51) and Leonte Carroo (DK: WR87, FD: WR99). Parker (if active), Stills, and Carroo are all solidly in play, but the situation is murky enough to make it tough to really like any one player. However, I lean Stills, as he’s likeliest to receive an expanded role in the slot and he’s always made the most of his opportunities when there. After complaining about a lack of volume earlier in the week, he also has the #SqueakyWheel narrative working in his favor this week. DeSean Jackson is out for Week 13. 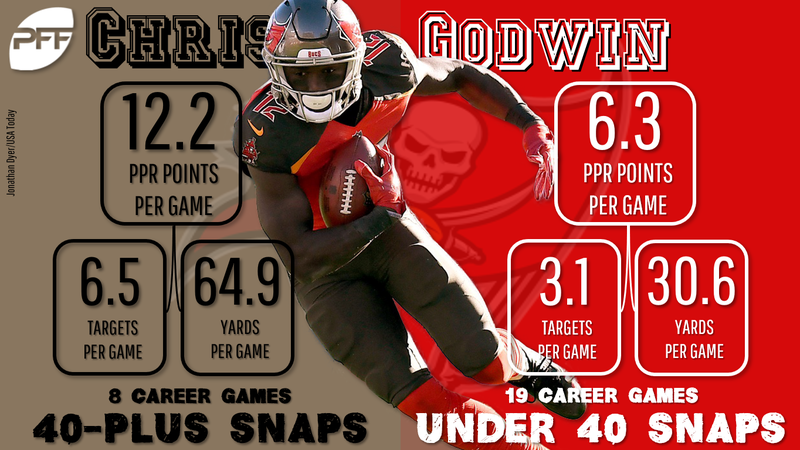 This boosts Mike Evans (DK: WR3, FD: WR8) and makes Chris Godwin (DK: WR54, FD: WR38) and Adam Humphries (DK: WR45, FD: WR26) legitimately great plays. Since Week 8, Humphries ranks seventh among all wide receivers in fantasy points, averaging 16.8 fantasy points per game. Godwin has played on only 51% of the team’s snaps over his last four games but will now serve in more of a full-time capacity this week. In the three games Jackson or Evans missed last year, Godwin averaged 9.3 targets and 16.2 fantasy points per game. Kerryon Johnson is out and Bruce Ellington (DK: WR67, FD: WR65) is questionable for the Lions. Johnson’s absence means an increased workload for LeGarrette Blount (DK: RB34, FD: WR28) and Theo Riddick (DK: RB22, FD: RB35). In a much tougher matchup last week (against the Bears), Blount totaled 20 touches for 103 yards and two scores. The Rams rank sixth-worst in yards allowed per carry for the second consecutive season, which should bode well for Blount. He’ll also dominate work near the goal line, but he’s still a tough sell in what will likely be a blowout in Los Angeles’ favor (they’re favored by 10 points). All of that negative gamescript (and Ellington’s questionable status) should help Riddick, who has seen target totals of eight, seven, six, and seven over the last four weeks of the season. If Ellington is active, he’s still in play this week. He’s seen 16 targets over the last two weeks, making him one of the top target-per-dollar values on the slate. Stefon Diggs (DK: WR8, FD: WR10) is questionable but likely to play against the Patriots. It’s hard to trust Diggs this week, given the matchup (shadow coverage from our No. 2-graded cornerback Stephon Gilmore) and his history when on the injury report. Robby Anderson is questionable for the Jets. If he’s out, give a slight boost to Quincy Enunwa (DK: WR48, FD: WR51) who has one of the softest matchups of the week. He’ll run the plurality of his routes from Josh McCown’s left, which is where the Titans are giving up a league-high 16.7 fantasy points per game. Devin Funchess is questionable but expected to play in Sunday’s game against the Buccaneers. If he’s out, give a boost to all other options in the passing game – D.J. Moore (DK: WR20, FD: WR20), Curtis Samuel (DK: WR54, FD: WR30), Christian McCaffrey (DK: RB2, FD: RB3), and Greg Olsen (DK: TE7, FD: TE5). Keke Coutee is a game-time decision. DeAndre Hopkins (DK: WR2, FD: WR1) averages more fantasy points per game when Coutee has missed time. Hopkins is going overlooked despite a soft matchup against a Cleveland defense that ranks third-worst in schedule-adjusted fantasy points per game to opposing WR1s. Indianapolis tight ends Jack Doyle and Mo Alie-Cox are out, while Erik Swoope is also questionable. All of this makes the already chalky Eric Ebron (DK: TE6, FD: TE9) that much more of a good play. More on him later. Marlon Mack (DK: RB19, FD: RB12) is questionable for the Colts. If Mack is out, boost Jordan Wilkins (DK: RB56, FD: RB35) and Nyheim Hines (DK: RB30, FD: RB44). Wilkins averaged 8.5 carries and 1.8 targets per game when Mack sat out. Hines, the much better play of the two, averaged 7.3 carries and 8.3 targets per game. With Jacksonville ranking seventh-best in yards allowed per carry (3.82), it makes more sense for Indianapolis to lean heavier on Hines through the air (as an extension of the running game) than either running back on the ground. Sammy Watkins is out Sunday, which makes Chris Conley (DK: WR58, FD: WR99) a strong value play. He’s played on 90% of the snaps over his last two games, totaling 10 targets, eight receptions, 96 yards, and two touchdowns over this span. Marquise Goodwin and Pierre Garcon are out, making Dante Pettis (DK: WR58, FD: WR44) a sneaky play. He’s seen 13 targets over his last two games and scored 17.7 fantasy points last week. Though, I think George Kittle (DK: TE2, FD: TE2) is the best play on this team. He hit a season-high in expected fantasy points last week (21.1), with Goodwin and Garcon out. Though the production wasn’t there, he’s been efficient enough all year (leads tight ends and would rank fifth among wide receivers in yards per route run) that I’d bet he rebounds this week. Gus Edwards and Alex Collins are both questionable this week. Edwards (DK: RB21, FD: RB15) is very likely to play while Collins is more of a game-time decision. Edwards is still a top play this week, despite the questionable tag. He’s hit at least 115 rushing yards in back-to-back weeks. Over this span, he totals 40 carries, 233 yards, one touchdown, zero targets, and 13 missed tackles forced (most). The lack of target volume is a risk, with tentative gamescript against the Falcons (Baltimore is favored by only 1.0 points). Still, Atlanta is a soft matchup overall, ranking fourth-worst in yards allowed per carry and third-worst in fantasy points per game allowed to opposing running backs. Newton is quietly putting together the most efficient (passing) season of his career, hitting triple digits in passer rating for the first time in his career (103.8). 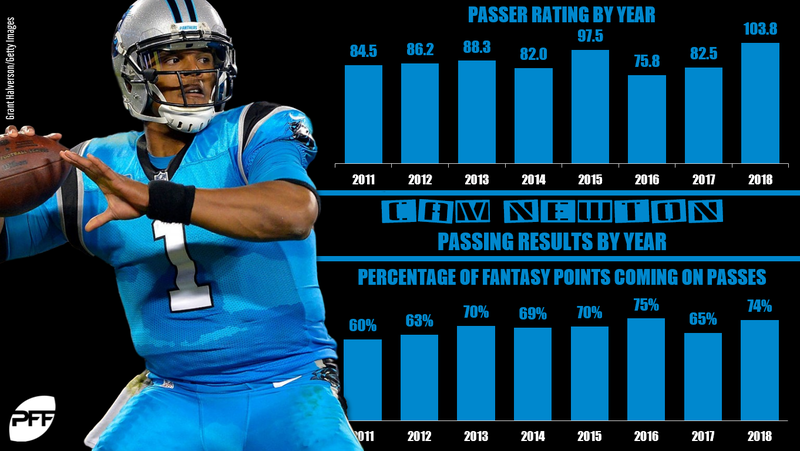 Newton has thrown for two or more touchdowns in each of his last 10 games, while averaging 253.8 passing yards per game over this stretch. That’s also not including an additional 5.4 fantasy points per game on the ground. This week he gets a Tampa Bay defense that ranks third-worst in fantasy points allowed per dropback (0.69) and is on pace to set an all-decade low in opposing passer rating (119.5). With his price so cheap on DraftKings ($1,000 separating him from QB1 and QB13), it’s hard to make a case against him being the chalk. Mahomes has not only been the league’s best fantasy quarterback, but he’s on pace to put together the best fantasy season of all time. His 27.3 fantasy points per game is the most by any player at any position in any season all-time. With that in perspective, he’s a screaming value this week. Gamescript would be a concern for any other quarterback (Kansas City is favored by 14 points), but Kansas City has still thrown the ball more often than they’ve run, even when leading by seven, 10, 15, or 20 points. In Week 10, a 35-point victory against the Bengals that was a blowout throughout, Mahomes played the entire game and scored 33.8 fantasy points. Even if Mahomes does get pulled at some point, there will still be plenty of time to hit value against this porous defense. Oakland ranks second-worst in points allowed per drive (2.95), and to quarterbacks, fourth-worst in opposing passer rating (104.5), worst in pressures generated per dropback (0.22) (Mahomes leads the league in clean pocket passer rating), and worst in fantasy points per dropback (0.78). For perspective, Mahomes is averaging 0.73 fantasy points per dropback, or the most by any quarterback this past decade. Through two starts, Jackson appears to be living up to my lofty Konami Code-related expectations for him. Over this span he ranks 13th at the position in fantasy points, despite scoring just two total touchdowns – everyone above him has scored between four and eight touchdowns. This was also against two teams that struggled to put up points, allowing him to take a more conservative approach, but that is unlikely be the case this week against the Falcons (48.5-point over/under, spread +/- 1.0). Atlanta also ranks third-worst in points allowed per drive, and to quarterbacks second-worst in fantasy points per game, fourth-worst in rushing fantasy points per game, and third-worst in opposing passer rating. Other: Outside of these three names, Kirk Cousins (DK: QB14, FD: QB11) and Baker Mayfield (DK: QB12, FD: QB12) are both vaguely in play. Nothing about Mayfield’s matchup stands out, but Houston is equally tough on the ground, and Mayfield has been on a tear lately. … Cousins ranks ninth in fantasy points and draws a New England defense that ranks bottom-seven in schedule adjusted fantasy points per game allowed to quarterbacks for the second season in a row. Jones is bordering on a must-play this week. Over the past two seasons, he leads all running backs in yards per carry (5.79). Over the past three weeks, he ranks fifth among all running backs in fantasy points per game (25.9). Over this span he’s played on 79% of his team’s snaps while drawing 90% of the carries and 100% of the targets out of the backfield. After two tough matchups with bad gamescript, Jones has an ideal matchup this week. Green Bay is favored by 14, up against an Arizona defense that is giving up the most rushing fantasy points per game to opposing running backs (20.9) and ranks 12th-worst in yards allowed per carry. Green Bay should also lean heavier on Jones, given the matchup in the passing game. The league’s best shadow cornerback – Patrick Peterson – is likely to shadow Davante Adams this week, and Aaron Rodgers has struggled when throwing to all other receivers this season. It’s also Jones’ birthday on Sunday, if that means anything to you (#BirthdayNarrative). Over the past two weeks, even with Royce Freeman back, Lindsay has still maintained 60% of the team’s snaps and 64% of the team’s touches out of the backfield. 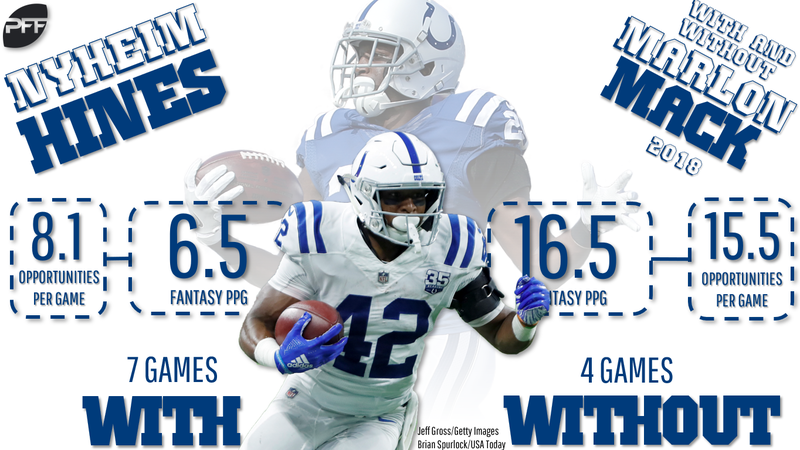 In addition to good volume in recent weeks, he’s also been hyper-efficient all year, ranking third-best in yards per carry (5.8) and 10th-best in PFF grade. This week he gets a Cincinnati Bengals defense that is giving up the second-most fantasy points per game (32.1) and the fifth-most yards per carry (4.91) to opposing running backs. McCaffrey totaled 35.6 expected fantasy points in Week 12, the fifth-most by any player this season. His production was even better, scoring 46.9, or the most by any player in over a year. He currently ranks fifth among all players in both expected and actual fantasy points per game. Since Week 8, he leads all players in both expected (22.1) and actual fantasy points per game (31.0). For the season, he ranks second among all players in expected fantasy point market share (29%). He also leads all running backs in snaps (671) and snap share (97.9%). Basically, it makes little sense to like Cam Newton as much as we do or the Panthers offense as much as Vegas does (28.75 implied total), and not also love McCaffrey – and especially this week, as Tampa Bay ranks fifth-worst in schedule adjusted fantasy points per game to opposing running backs. Other: If Todd Gurley (DK: RB1, FD: RB1) is fully healthy, he’s probably worth paying up for this week. Sean McVay expects him to be back to his normal self on Sunday, and Gurley should draw low ownership after busting against the Chiefs (though the lack of production was likely entirely injury-related). He was on a historic pace prior to the Kansas City game, and this week’s matchup is neutral at worst. … Saquon Barkley (DK: RB3, FD: RB4), like Gurley, has been on a historic pace, and has only been getting better as the season has progressed. More importantly, again like Gurley, he hasn’t been slowed at all by seemingly difficult matchups. I suspect the matchup this week isn’t really as bad (for him) as DraftKings and FanDuel have made it out to be (judging by the price drop at least). … Nick Chubb (DK: RB8, FD: RB6) has seen between 20 and 31 touches in each of his last four games. He averages 22.3 fantasy points per game over this stretch. He ranks first among all running backs in elusive rating and second in PFF grade. Nothing about the matchup stands out, but he does make sense as a “bet on talent” play. … Carlos Hyde (DK: RB56, FD: RB39) saw 10 carries and zero targets last week (with Leonard Fournette exiting in the third quarter) to T.J. Yeldon’s three carries and four targets. After complaining about a lack of volume on Tuesday, Jacksonville might try to appease him by getting him more work this week. In a neutral matchup against the Colts, he’s about $1,000 too cheap on DraftKings ($3,300). That said, he probably isn’t necessary this week, because Ware is the far better value, and his lack of passing game volume in recent weeks (zero catches since Week 5) makes him risky. Woods has been Los Angeles’ WR1 all year, leading the team’s receivers in expected fantasy points per game regardless of whether Cooper Kupp was active. However, he has seen his best usage with Kupp out of the lineup. When Kupp has sat out, Woods has averaged 16.5 expected fantasy points per game, an increase of 1.6, and what would be 11th-best at the position if over a full season. Woods also spends more time in the slot when Kupp is out (67% vs. 39%). That’s especially important this week, against a Lions defense that ranks seventh-worst in fantasy points per game allowed to opposing slot wide receivers. With Brandin Cooks in a much tougher matchup (shadow coverage from Darius Slay), Jared Goff would be wise to look Woods’ way even more often this week. Golladay has made the most of an expanded role, following the departure of Golden Tate and a Week 10 knee injury to Marvin Jones. Since that injury to Jones, Golladay ranks seventh among all wide receivers in expected fantasy points per game (19.5) and 12th in actual fantasy points per game (19.7). Among all slate-eligible wide receivers, he ranks fifth and eighth, respectively. Already a value based on usage, the matchup should work toward his favor as well. Over the past five weeks, Los Angeles ranks second-worst in schedule-adjusted fantasy points per game allowed to opposing WR1s. Yes, early reports suggest the Rams should be getting Aqib Talib back, but, how much he plays is still up in the air. 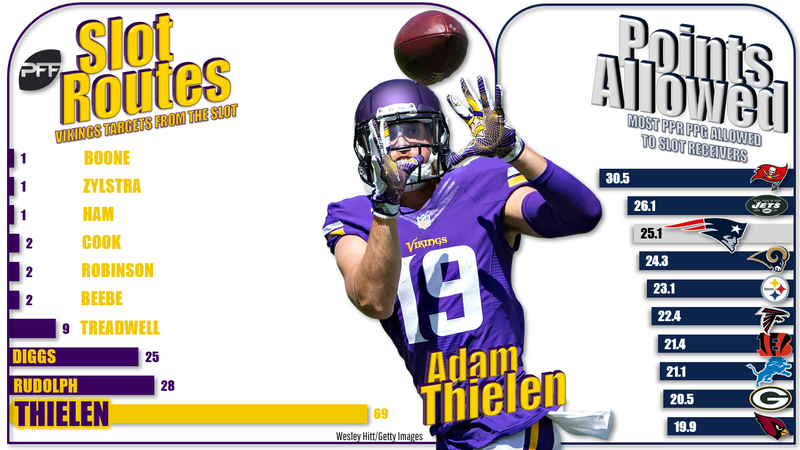 Thielen has not only been fantasy’s most productive wide receiver (23.3 fantasy points per game), but, by our grades, he’s also been the best in quality of play (leading the position with a 91.2 PFF grade). Thielen has been as steady as they come, scoring at least 14.0 fantasy points in every game this year, but volume and production has fallen off a bit in recent weeks. Stefon Diggs has actually outscored Thielen in expected fantasy points in six of his last seven games. It’s hard to imagine that trend continuing this week, with Diggs legitimately questionable (historically, Diggs has struggled when on the injury report) and up against Stephon Gilmore (our second-highest-graded cornerback this year) in shadow coverage, and with Thielen in a much better matchup on paper. In each of the past three seasons, New England has ranked bottom-six in fantasy points per game allowed to opposing slot wide receivers. Of course, there’s also the narrative that New England sells out to stop an opposing offense’s top weapon, but I’m not sure that will be true in this instance. Since 2016, there have been 12 instances of a wide receiver scoring at least 20 fantasy points against New England. Of those, over half were from wide receivers running at least 45% of their routes from the slot and who were arguably New England’s biggest threat: Tyreek Hill (2x), Doug Baldwin, Larry Fitzgerald, Jarvis Landry (3x). Other: Tyreek Hill (DK: WR1, FD: WR1) is probably your best option among the high-priced wide receivers. He’s not as safe as Thielen, but Thielen probably doesn’t have Hill’s slate-busting upside. There just isn’t really the need for any lengthy analysis. The Chiefs have a 35.0-point implied total, Hill has been unstoppable, and Oakland doesn’t have anyone who can cover him. … Odell Beckham Jr. (DK: WR6, FD: WR5) is going overlooked in what looks like a tough matchup, but is actually fairly soft, making him an even greater value after the price decrease. Chicago is giving up the fourth-most fantasy points per game to opposing outside wide receivers. After complaining about a lack of targets earlier in the week, hopefully this means Beckham gets more involved this week. … Tyler Lockett (DK: WR18, FD: WR17) is too expensive relative to volume, but too cheap relative to recent production. I tend not to bet on these sorts of players, but he is in play this week. … Corey Davis (DK: WR21, FD: WR28), on the other hand, is far too cheap relative to usage. Among wide receivers he ranks 18th in expected fantasy points per game and seventh in expected fantasy point market share. Though efficiency has been more hit or miss, nothing stands out about this matchup as being prohibitive. … Emmanuel Sanders (DK: WR14, FD: WR16) is another apparent value. He ranks 11th among the slate-eligible wide receivers in fantasy points per game and draws a Bengals defense that is giving up the 10th-most fantasy points per game to opposing slot wide receivers. With Jack Doyle on IR, Ebron easily becomes the best play on the slate before considering ownership. Despite splitting time with Doyle in over half of his games, Ebron averages 17.7 fantasy points per game this year. That number ranks third-most among tight ends and 22nd among all receivers. When Doyle was active, Ebron averaged only 4.4 targets per game, 20.2 routes run per game, and 9.9 expected fantasy points per game, but with Doyle out, those numbers jump to 9.6, 37.8, and 18.0, respectively. Those numbers would rank second, first, and first among all tight ends. And 18.0 expected fantasy points isn’t just best among all tight ends (by 1.1 points), but it would rank sixth-best among all receivers. This week’s matchup serves as a final cherry on top of Ebron’s chalk status. Jacksonville has given up 25.2% of their total receiving fantasy points allowed to opposing tight ends (sixth-most), and when these two teams faced off in Week 10, Indianapolis tight ends combined to total eight catches, 143 yards, and three touchdowns (on 10 targets). Other: In larger field tournaments where a contrarian approach has more appeal, I’d consider the following tight ends: Travis Kelce (DK: TE1, FD: TE1), George Kittle (DK: TE2, FD: TE2), Austin Hooper (DK: TE10, FD: TE8), Cameron Brate (DK: TE13, FD: TE19), Matt LaCosse (DK: TE29, FD: TE24), and Rhett Ellison (DK: TE23, FD: TE24). Kelce and Kittle make sense (even as flex plays) given their production at an otherwise ugly position. Kelce gets an Oakland defense that ranks 10th-worst in schedule-adjusted fantasy points per game to opposing tight ends. Kittle is coming off of a season-high in expected fantasy points (21.1), though he should draw low ownership after busting at high ownership (11.8 fantasy points). … Since Week 5, Hooper ranks fourth among tight ends in targets per game (7.3) and sixth in fantasy points per game (12.9). He gets a Baltimore Ravens defense that has given up 27% of their total receiving fantasy points allowed to tight ends, which ranks most in the NFL. … Brate is in play for all the reasons we liked him last week. He played on a season-high 70% of the team’s snaps and scored a touchdown, though target volume wasn’t as good as we expected. … LaCosse caught three of four targets for 34 yards and a touchdown last week. He’s the only active Denver tight end to record a catch this year. … Ellison caught four of six targets for 77 yards last week and will continue to serve in an expanded role with Evan Engram out.